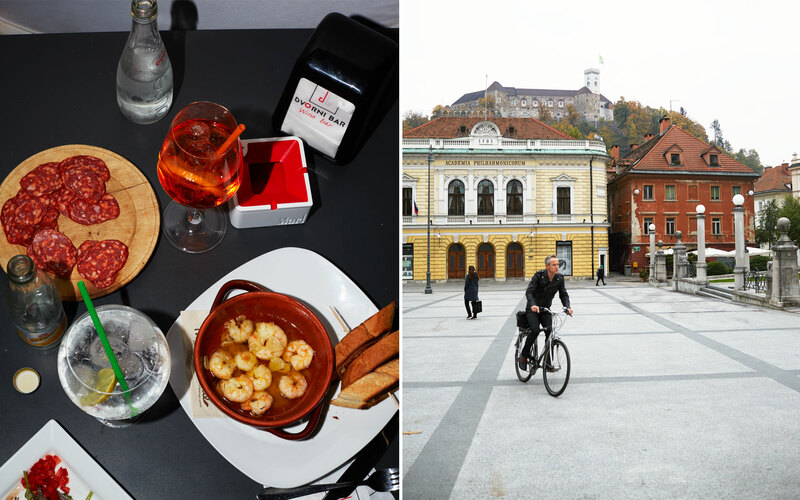 With meals that feel like magic shows and brightly colored wines made by mysterious alchemical techniques, Slovenia has become one of the continent's most intriguing places to eat and drink. Alex Halberstadt falls under the country’s spell. What we first noticed driving east from Venice were the sudden hills, fog clinging to their peaks, and the groves of persimmon trees, heavy with fire-orange fruit. Soon the signs changed from Italian to Slovene and four-sided Romanesque church towers began rising in the distance, and everything looked almost familiar, but not quite. The sensation wasn’t entirely unexpected. As a country, Slovenia is not even 25 years old, but for centuries its territory formed a buffer zone between larger nations, a land ruled by outsiders who left indelible traces before leaving. Visiting the country felt like being somewhere I’d never been but seemed to remember anyway. Nowhere is this living history more apparent than in the local food and wine, two of the most exciting reasons to come to this wedge of former Yugoslavia. To eat in Slovenia is to encounter influences from Italy and Austria, Hungary and Croatia, even Turkey and Russia. And in recent years, the country’s wines—particularly the savory, tannic whites that obtain their coppery hue from contact with grape skins—have captured the attention of serious drinkers from Tokyo to New York. 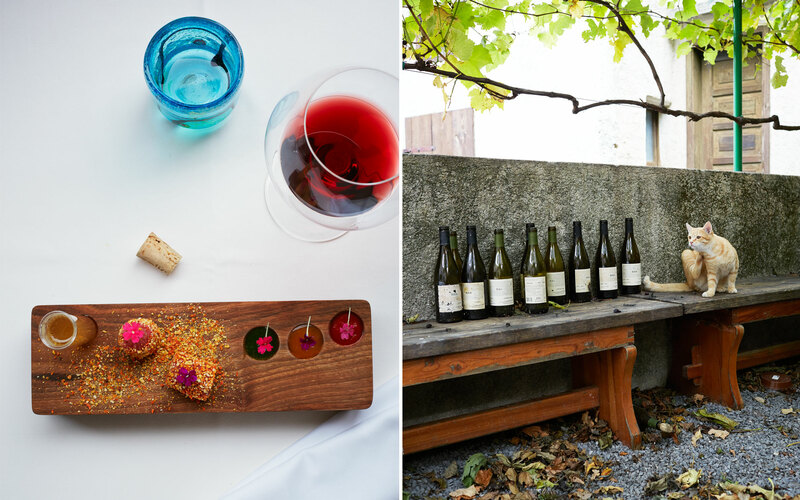 In the countryside and in the capital of Ljubljana, winemakers and chefs are now using the traditional kitchen as a laboratory to create an evolving but hugely original food culture. That is why meals here occasionally take on the qualities of a tale by the Brothers Grimm—primal, strange, and not easily forgotten. From left: Movia Estate, Slovenia's most influential winery; Borut Licen, manager of Vinoteka Movia, a wine bar in Ljubljana. My friend Garrett Oliver was piloting our miniature Fiat convertible over the hills of Goriška Brda, just beyond the Italian border. Garrett is the brewmaster at the Brooklyn Brewery and a walking culinary encyclopedia. Because Slovenia was a part of the Eastern bloc when he last visited, he approached each of our meals with the seriousness of an archaeologist cataloguing an Aztec city. In the distance, we spotted the Kabaj winery, restaurant, and hotel, a place set into a hillside at an angle so precarious that it looked like it might slide away at the lightest drizzle. The owner, Jean-Michel Morel, a Frenchman who resembles a detective from a New Wave noir, came here nearly 30 years ago after marrying a Slovenian winemaker’s daughter. We sat down for lunch with him in the courtyard while his wife, Katja, brought bowls of a sour turnip soup called jota. All around were vineyards and hills. We were 15 miles from the Adriatic, but could have been half a continent away. Morel poured us his Rebula, an orange-hued white that smelled, improbably, of roses and tea. He ages the wine the way ancient Romans did: in clay amphorae lined with beeswax and buried in the ground. “Most orange wines are mistakes,” Morel said bluntly. His was not: I found it more delicate and fun to drink than most I’d had. Garrett and I hurried through dessert—tiny winter pears boiled in wine with a chestnut mousse—and thanked the Morels, because we had an appointment just beyond the neighboring hill. 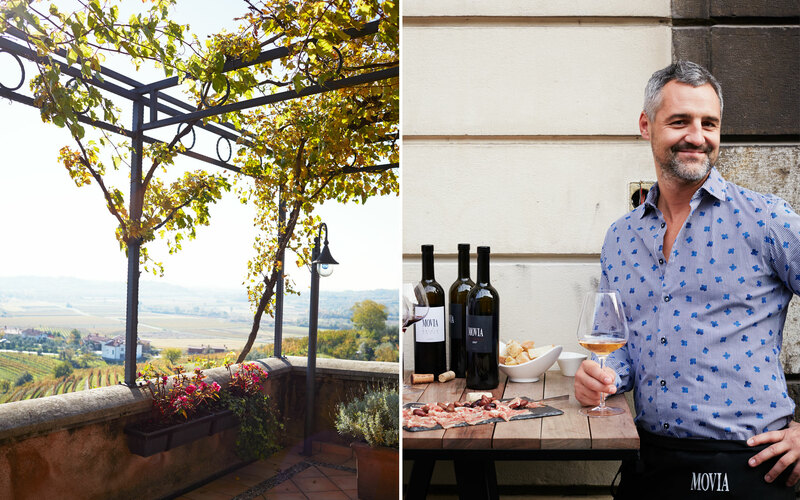 Our rendezvous was with Aleš Kristančič, the most prominent figure on the country’s food and wine scene. After the fall of Yugoslavia, he decided to focus on making idiosyncratic wines based on local grape varieties rather than imitate the Italians and the French. Soon he was being discussed around restaurant tables around the world. He seemed to have influenced nearly every winemaker and chef we met. His winery, Movia, is a pink stucco palace set atop a jutting hill. Inside, there was a spray of orchids on a grand piano and a photo of Kristančič decapitating a bottle with what appeared to be a broadsword. A monumental oil painting nearby depicted the disembodied heads of Kristančič, his wife, Vesna, and their two children floating above the Parthenon. “Memories,” from Cats, was playing at breathtaking volume on the sound system. It was nearly dusk in Goriška Brda, and the hills around us glowed the color of Welch’s grape juice. 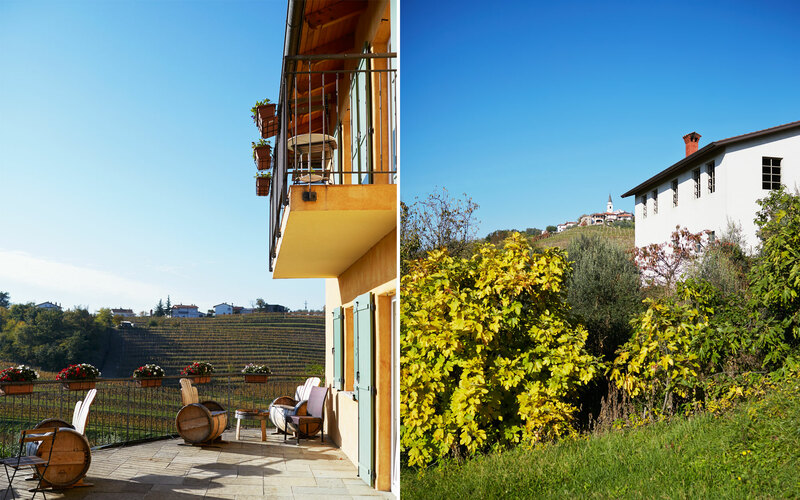 From left: The vineyards of Kajab, in western Slovenia; a guesthouse at the winery, which is nestled in the hills of Goriška Brda. Nearly an hour after we arrived, Kristančič appeared, smiling, trailing a flustered assistant. A man of easy charisma, he regaled us with stories about the region’s Yugoslavian past. When his father, a seventh-generation winemaker, refused to join the local socialist cooperative, young Aleš was reprimanded at school for the misdeed. He seems to have inherited his father’s obstinate spirit, because his wines sometimes defy common sense. Take Puro, which has become his trademark. Nearly every maker of sparkling wines disgorges his product—uncorks the bottles after secondary fermentation to eject the spent yeasts—at the winery. Puro must be the only one intended to be disgorged at home by the consumer. Vesna demonstrated this by submerging a bottle in a tank of water and popping it open with a device resembling a back scratcher. It tasted bone-dry and saline, with a note of sage that seems to infuse everthing from Movia. At Pri Lojzetu, located in a 17th-century hunting lodge at the foot of the Julian Alps, we met the genial, foxlike Tomaž Kavčič, who goes by Tomi and whose great-grandparents founded the restaurant in the 1890s. Kavčič conceives fine-dining interpretations of his family’s generations-old recipes with a dash of Siegfried & Roy. Early in the meal, he presented us with trays of juniper surrounding a tiny glass of gin and tonic, then flooded our table, and us, with dry-ice fog poured from a watering can. It was the first time I had been submerged in my food. Could we tell how the fog circulated the aroma of the juniper, Tomi asked excitedly. We said that we could. Later, he appeared with rectangles of meat that had been subjected to many hours of sous vide alchemy. “Jowl of bear,” Tomi offered nonchalantly, in an accent that allowed for a sliver of uncertainty. “Pear?” Garrett asked, clearly unprepared for the truth. “No, bear,” the chef replied. Eager to clarify, he set down the plates, stood on tiptoe with his arms raised, and growled. The meat, gamey and sharp, turned out to be unexpectedly tender. Though Majerija is one of the country’s best-known restaurants, we nearly gave up trying to find it. After leaving the highway we drove along a smaller road and found ourselves on an unpaved, boulder-strewn lane bordering vineyards and vegetable fields. The GPS surrendered entirely, flashing in despair. Finally we saw a sign on a tree, about four inches square, depicting a diagram of a plate and a wine glass. The most memorable part of the lunch there was the mlinci—house-made pasta grilled on a cast-iron stove and topped with broccoli and smoked duck breast, both sourced nearby. 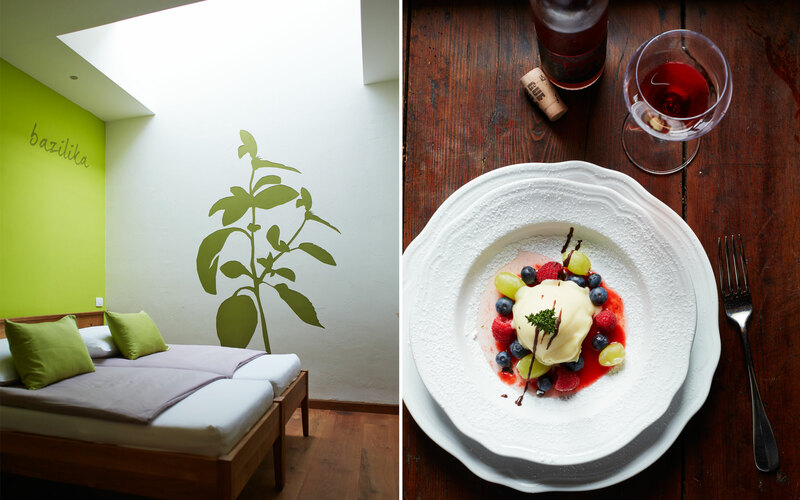 From left: The Basil Room at the restaurant and hotel Majerija; thyme sorbet at Majerija. Tomažič and his wife, Nataša, recently added a hotel to the property. Because of laws prohibiting new buildings in the vicinity of old ones, they placed the guest quarters underground, beneath the herb garden. The stylish rooms, each named after one of the herbs, were painted in pastel hues, giving the interiors the look of a posh Mexican spa, except for the skylights and humming ventilation. In the morning, it was confounding to emerge from this elegant dungeon to views of mountains and acacia-edged fields, and to inhale the scents of woodsmoke and rosemary that hung in the almost voluptuously fresh air. After breakfast, we found Primož Lavrenčič on the grass outside the restaurant waiting to take us to his winery, Burja Estate. Wearing a flannel shirt and smoking a hand-rolled cigarette, he looked as unassuming as a Portland barista. But he is one of Slovenia’s best winemakers. He consulted for a decade at his family’s respected winery, Sutor, before parting ways with his brother in 2009 over what could be called artistic differences. While Sutor bottles dense, oaky Merlots and Chardonnays, Lavrenčič focuses on indigenous grapes at Burja, some of which are all but unknown outside Slovenia. He uncorked a decade-old bottle of his specialty, a white called Zelen that may be his country’s gift to the wine world. Fresh and stony, with an enticing, cheeselike aroma, it tastes like nothing else and ages gracefully, as my first taste proved. Burja is named for the cold wind that howls through the valley, sometimes reaching 125 miles per hour and decimating the vines. Lavrenčič took us to the tiny house he and his wife rent nearby, where we met his two young daughters, who were trying to teach a docile orange cat to waltz. In the cellar, which had been a hiding place for members of the antifascist resistance during World War II, an antique crucifix hung on a bare stone wall. A cobweb-covered shelf beside it was filled with empties of priceless old Burgundies. Lavrenčič shrugged. “I like Zelen, but I like those, too," he said. Ljubljana lay a 45-minute drive east. The city was an outpost of the Hapsburg monarchy for more than half a millennium, then was fought over by European powers for most of the 20th century. Today, it is finally independent. Much of it was rebuilt after an earthquake in 1895, lending it a remarkable visual consistency, with many odd and wonderful examples of Art Nouveau architecture. One is the Dragon Bridge that spans the Ljubljanica River, a tribute to the beast that is said to have been slain here by Jason and the Argonauts. Ljubljana appeared to be devoid of American tourists; while we walked around, several men of Yugoslavian vintage stopped and gaped unselfconsciously at Garrett, startled to encounter a passerby of African descent. We arrived for lunch at Špajza, which means pantry in Slovene, only to find it closed. Fortunately, the owner, Petra Sorbara, answered the door. “No problem,” she said. “I will open it and be your waitress.” Sorbara’s brother, Erik, turns dishes that many Slovenians remember from their grandmothers’ kitchens into pristine restaurant food. Ajdovi žganci na kislem mleku z ocvirki—cold-smoked buckwheat porridge with sour milk and cracklings—was one of the most haunting things I’ve tasted. “For many of us who grew up here,” Sorbara explained, “this used to be breakfast.” It was followed by a tartare of a deer that Sorbara’s father had shot, topped with a raw quail egg and wasabi foam. Later, she brought us a fillet of young horse—it tasted remarkably like aged beef—rolled in black truffles. We set to work on this paleo feast seated at a rough-hewn farm table, surrounded by antique photos and cut flowers, the only customers in one of the city’s most popular eateries. From left: The "idea of beef" soup at Pri Lojzetu, a restaurant in a 17th-century hunting lodge; the house cat at the winery Burja Estate. It was nearly time for dinner, so Garrett and I took a taxi to Cubo, a crowded, brightly lit space on the city’s outskirts that turned out to be an unabashed celebration of Slovenian capitalism. The parking lot was packed with the kinds of cavernous black sedans that often come outfitted with curtains. The interior was decorated with paintings of large-denomination euro notes and vitrines containing taxidermied birds plucking jewelry out of geodes. The garrulous owner, Boštjan Trstenjak, sat with us and guided us through the salient points of his biography: after starting out as a waiter in a Yugoslavian disco and a used-car salesman in East Germany, he founded Cubo in 2003 and began his inexorable climb to the summit of Slovenian fine dining. He was the country’s first chef to publish his own cookbook, he informed us. In 2010, he opened a second Cubo in the city center—where the previous afternoon I had tasted a porcini risotto better than any I’d eaten in Italy—but last year he sold it to some Russians. Like the room, the food at the original Cubo was modern and bright, if not particularly Slovenian, and everyone around us appeared to be having exaggerated amounts of fun. “Isn’t this awesome?” Trstenjak exclaimed, before leaving us with our octopus. We spent our final waking hours in Ljubljana at Vinoteka Movia, a wine bar opened several years ago by Aleš Kristančič to showcase his bottles in the capital. There we met Eva Klemenčič, a 25-year-old employee who was studying for the Master Sommelier exam. She poured us glass after glass of unfamiliar wine—a lime-scented Pinela, a savory Klarnica—while patiently answering our questions. On the quiet side street outside, the chestnut roasters were rolling their carts away and the last drinkers were heading home, and it was easy to succumb to the illusion that the city had been this way for centuries. We were the last customers. “To renewal,” Garrett said. We raised our glasses before Klemenčič wished us safe travels and shuttered the bar behind us. From left: Hors d'oeuvres at Dvorni, a Ljubljana wine bar; Congress Square, in central Ljubljana. Hotel Cubo: A historic property with sleek, modern rooms and a fantastic restaurant of the same name. Ljubljana; hotelcubo.com; doubles from $131. Majerija: After indulging in top-notch cuisine at the property’s restaurant, head underground to one of the 10 subterranean rooms, named after herbs growing in the garden above them. Vipava Valley; majerija.si; doubles from $104. Dvorni Bar: A well-loved and centrally located wine bar where patrons often spill out onto the street. Ljubljana; dvornibar.net. Hiša Franko: Legend has it that Hemingway wrote sections of A Farewell to Arms at this estate, whose restaurant is known for its delicious Slovenian wines. Kobarid; hisafranko.com; tasting menus from $78. JB Restaurant: Ljubljana’s top fine-dining restaurant, housed in an Art Deco building. jb-slo.com; entrées $16–$33. Pri Lojzetu: Family-owned for four generations, this restaurant offers a magic-show take on the region’s cuisine. Vipava Valley; prilojzetu.si; entrées $21–$60. Špajza: Bistronomic fare like deer tartare topped with wasabi foam is served here in a rustic interior on one of the city’s most picturesque streets. Ljubljana; spajza-restaurant.si; entrées $20–$26. Strelec: Igor Jagodic cooks flavorful dishes like roasted duck breast with honey, figs, and artichokes inside Ljubljana Castle. kavalgroup.si; tasting menus from $46. Vinoteka Movia: Operated by Slovenia’s best-known winemaker, this bar has a large selection of wines from every corner of the region. Ljubljana; movia.si. Zvezda: A classic pastry shop and café offering delightful views of the Ljubljanica River. Ljubljana; zvezdaljubljana.si. Burja Estate: Owner Primož Lavrenčič spent years traveling in Burgundy before founding this vineyard, which produces only organic wines, in the Vipava Valley. burjaestate.com. Kabaj: The Rebula ages here in beeswax-lined clay amphorae buried in the ground—a technique used by the ancient Romans. Goriška Brda; kabaj.si. Movia: This estate along the Italian border dates back to the 18th century. Goriška Brda; movia.si/en/hisa-movia.